MMATS is actually the pioneer of all Car Audio Class D amplifiers on the market. We created the topology for Class D “car” amplifiers back in 1995. Our approach has always been industry leading. We were producing 100 watts per linear inch when everyone else needed 36” to produce 1000 watts (US Amps). We still produce small chassis, high power amplifiers that are the most efficient in the market today. Of course, the way the other companies rate their efficiencies it makes their products look almost nuclear. Our ratings are full power at their lowest impedance…not a simple 4 ohm load as with others. Our fuse rating is so light because of this and we also rate the fuse at music power, which contains a lot of surges but is not sinewave. BTW, the M2000 in question is only 10” in length and weighs 10 pounds. Oh yes, ours is made right here in Jupiter Florida from the first resistor up. All of the electrical and mechanical engineering is done in house. We are truly the only American Made Car Audio amplifier company (large scale not boutique assembly) in the USA versus our competitors that source their products from either Korea, China or Brazil. MMATS M – Series car amplifiers have an all new heatsink design! More power and reliability! Models ranging from 600 to 3000 Wrms of earth shaking power! Extreme engineering for extreme power! • Ultra-Efficient Class D amplifier topology reaching 83% efficiencies at full power, provides the biggest power in a smaller chassis. You will find our power ratings to be on the conservative side. Many of our competitors can not produce their rated power. A MMATS Pro Audio car amplifier typically exceeds it’s power rating at the rated impedance. 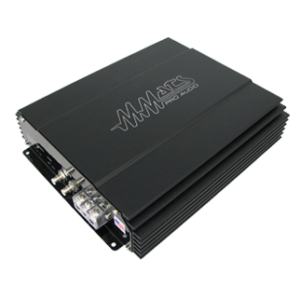 Get a MMATS M Series car amplifier so you can be sure you are getting all of the power you paid for! • 67,200 mfd capacitance on the battery inputs and 25,000 mfd capacitance on the outputs reinforcing the seat of the pants feeling that you can only get from a MMAT Amplifier leading many people to say “MMATS amplifiers are extremely underrated”. Add one of our M -Series amps to our Juggernaut or Monster series subwoofers and get ready for a truly unbelievable experience. Your mobile audio system will reach new heights when using MMATS Professional Audio equipment. View cart “M2000.05” has been added to your cart.